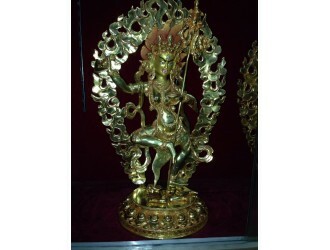 All Kind of Hindu and Buddhist gods and goddess deities which are available in richly gold plated fully and partially. Also available in brass made statues too. Vajrasatwa, the sixth Dhyani Buddha is regarded by the Nepali Buddhist as the priest of five Dhyani .. The Green Tara is regarded as spiritual consort of Amoghsiddhi, the dani Buddha.I Lamaist Tradition.. Statue -Nairatma - 20 Inches, full gold PlatedThe word "Nairatma: means "having no soul" and is anot..
Full Gold Plated-Shakyamuni BuddhaGautam Buddha is believed to have had 550 incarnations. Many previ..
Maitreya Buddha - 14 Inches hei8ght, Full colorful and 24 karat gold painted on face. Maitreya ..